Are you tired of the systematic fixed ringtone on your mobile phone? 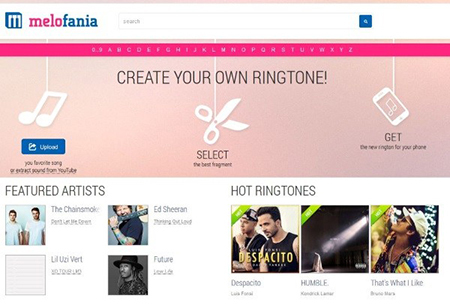 Do you want to customize an exclusive ringtone by yourself? If your answer is yes, you should read this review over. It lists top-ranked 5 best online ringtone maker for your reference. Taking the aid of one of them, you can enjoy yourself in processing audio files and make ringtone online pleasantly. Now, let's go start to see what they are. Coming with elegant design, Melofania draws much attention from a large wide of users. This compact web-based tool allows you to create ringtones from files you upload from your computer. Besides, you can also add extract sound from YouTube videos. Once an audio file is uploaded, Melofania will automatically play it for you. Move the sliders to select the ringtone range that you want. Or you can directly drag the whole cutting area in the desired direction. Note that the maximum accepted ringtone length for iPhone is 40 seconds. To make your destination ringtone better, you can adjust volume or add fade-in & fade-out in your way. Before you get the ringtone, you are permitted to revise its name according to your need. Melofania also let you pre-listen to it and download it to Android or iPhone. As its name suggests, Ringtone Maker is a ringtone cutter site that used to create ringtones for your mobile phones. But this popular tool is also a traditional ringtone maker website. Clearly, it has no access to extract audio straightly from YouTube videos or from other similar online platforms. Moreover, you have no chance to add any effects to your ringtone as well. Regardless of what mentioned above, it can do good job on making ringtones for you. Any frequently-used audio format, like MP3, OGG, WMA, WMV, FLAC, AAC, M4A, etc. are accessible. Its built-in player can facilitate you to get your favorite part. Alternatively, it can export finished ringtone to MP3 format for Android and M4R format for iPhone/iPad/iPod. If you are familiar with Ringtone Marker, you will be shocked at this similar Ringtone Cutter. At your first sight, you may think these two website are same. Frankly speaking, it is a bit hard for you to discover their difference. Both of them are available to make MP3 or M4R ringtones for you and can play smoothly on your mobile phone. Nevertheless, this tool is well developed with more concise interface, from which you will not see any ads on the screen. It also includes full supports for all common audio formats. Amazingly, it empowers you to import up to 20 audio files at one time. Magicode is another good choice for you. It can cut ringtone online quickly and easily without damaging original quality. Likewise, you don't have to worry about the size restriction of your uploaded audio file. Any large audio tracks can be loaded on this online ringtone cutter. It will work for you without re-encoding, meaning the quality will remain the same as the original one. To make a ringtone by keeping desired section left from the whole audio file, you just need to mark the beginning and end time. Magicode has adopted the new technology that is based on HTML5, which doesn't require flash for its working. However, you should know that this tool cannot help you select cutting points in accurate way as you are not enabled to setup temporal intervals. Differing from other online ringtone makers, MP3Cut provides more feasible entrances for you to input audio files, including computer hard disk, Google Drive, Dropbox and URL. Additionally, you can feel free to add audio track in any size. If you need, you can also extract sound from a video. That is pretty nice for you, especially when you'd like to get background music from a movie. This tool can be used to make ringtone online for your iPhone and save it as M4R format. However, it only let you make it 40 seconds long. During your trimming process, you can add fade-in and fade-out effects to your ringtone. Furthermore, over 300 different formats can be supported without problem. 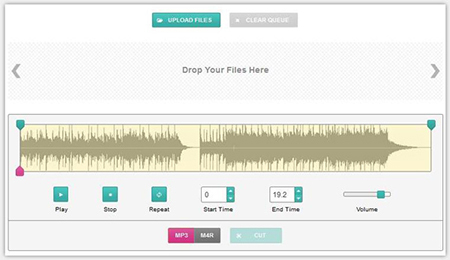 When you accomplish the editing assignment, MP3Cut will automatically delete it the audio file from its server. In accordance to your own preference, you can pick up whichever top-listed free MKV splitter. 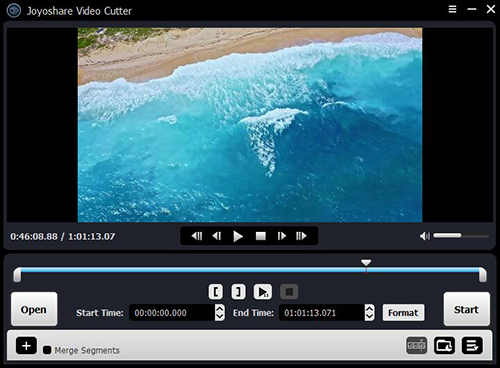 If all of them cannot match your expectation, you can get yourself a more chance to learn such a dedicated MKV Video Cutter, called Joyoshare Media Cutter. Excellently, Joyoshare Ringtone Maker is able to merge different segments into a new ringtone at up to 60X faster speed. This smart tool offers ability to you to utilize timeline and controller too. If you want to setup quality, codec, bit rate, size, etc., you cannot miss this wonderful chance. Note: To make ringtone online, online ringtone cutter is the most forthright tool while offline ringtone creator is more secure program. You should take all possible elements into consideration and then pick up a decent one. Create a Ringtone for Android? Solved!